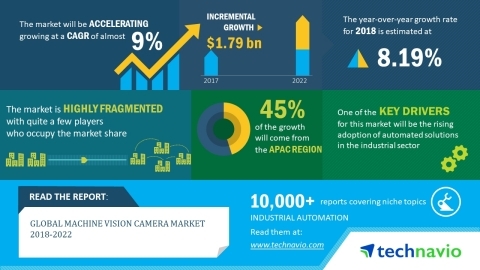 LONDON--(BUSINESS WIRE)-- The global machine vision camera market research report by Technavio predicts the market to post a CAGR of close to 9% during the period 2018-2022. “IoT enables the machine vision camera to provide real-time connectivity with the user, eliminates waste through optimization, enhances flexibility, increases the return on investment, and reduces the time-to-market and inventories. The use of IoT in machine vision cameras will ensure high cost savings and improved efficiency of the overall manufacturing operations,” says a senior research analyst at Technavio.